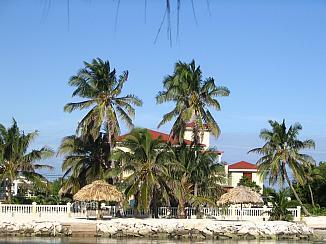 Adagio Villa - "Our Belize Vacation"
WELCOME TO ADAGIO VILLA ON AMBERGRIS CAYE FOR EXCLUSIVE LUXURY AND LOCATION ! ESCAPE TO ADVENTURE! 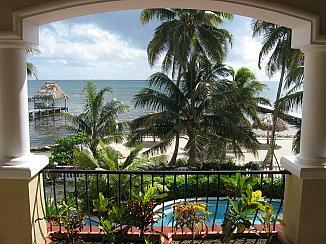 If you come to Belize for adventure, Adagio Villa is your perfect home base. Along with one hundred feet of beautiful Caribbean beachfront and four hundred feet of lagoon frontage, Adagio Villa offers you all the comforts of a high-end home and the luxury of an exclusive resort. A free rental golf cart and six bicycles are yours to help you explore the island by land. 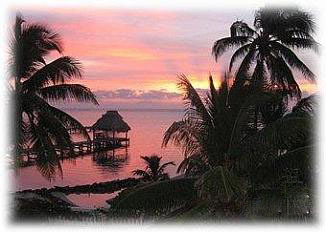 The Barrier Reef of Belize, visible from Adagio Villa, is less than a one minute boat ride from the pier to Tres Cocos Cut for fishing, diving and snorkeling. And when you're ready to further explore the island or make day trips to the mainland to explore the jungle, discover lost Mayan cities or try cave tubing, our concierge and estate manager will arrange for your tour guides to pick you up on our pier. And at the end of your stay, we will transport you back to the San Pedro Airport. 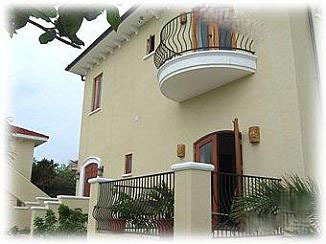 ESCAPE TO TRANQUILITY.... Adagio Villa can be a vacation destination in itself. 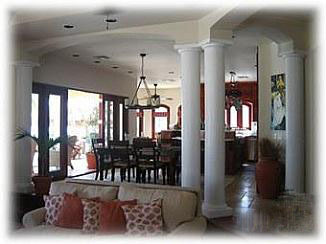 Adagio Villa was designed by its owner as a year-round luxury retreat. Located in exclusive Tres Cocos, Adagio Villa offers the discriminating vacationer or long-term renter all the amenities you come to expect in a high end home. Should you to choose to simply want to 'get away and relax' or use it perhaps as a honeymoon hideaway, these are a few of the amenities you can look forward to: Adagio Villa is a walled and gated property providing privacy and security without interfering with the trade winds that cool the island or the spectacular view of the Caribbean from the Villa. No expense was spared in creating Adagio Villa: the entire Villa and pool area are tiled with imported Turkish travertine. The trim and molding, cabinetry, doors and windows are all custom made of solid mahogany, cedar, Santa Maria and other exotic woods, surrounding you with warm luxury. 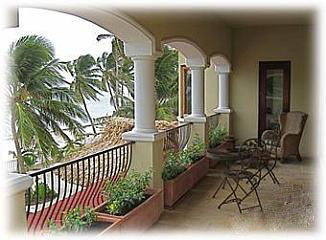 The columns and arches inside and outside the Villa allude to its Mediterranean influence. 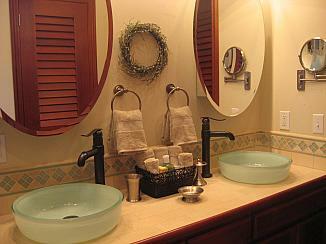 The hurricane glass in the windows and doors add to the sense of security while flooding the interior with light. 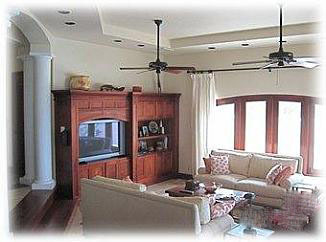 The sunken living room offers silk drapes, sumptuous furniture, a custom entertainment center with a 52 inch plasma screen, DVD/CD player with surround sound and an Xbox 360 for those occasional rainy days. 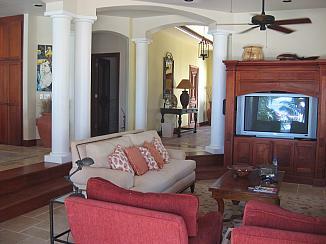 To stay in touch, a cell phone is provided along with a computer and Wi-Fi is available throughout the Villa. 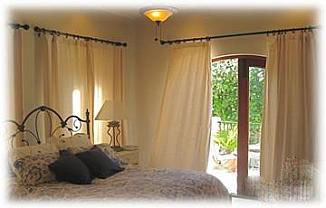 The entire Villa has zoned central air as well as Hunter fans in each bedroom, the living room and the kitchen. 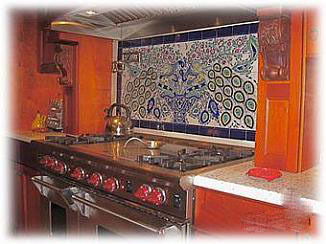 The kitchen is a chef's dream, completely equipped and laid out to make the home chef's experience a delight. Cooking for two or ten is enhanced with the Wolf Professional Range and the spacious prep areas. Or if cooking is not on your list of things to do, for your convenience we offer three optional meal plans in which our housekeeper and cook will prepare and serve wonderful Belizean specialties. 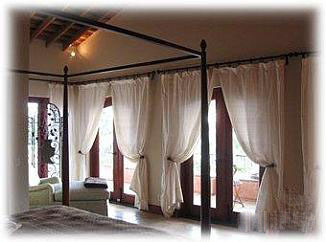 The three bedrooms are all en suite with queen size beds, LCD TV's and each having a balcony or veranda. 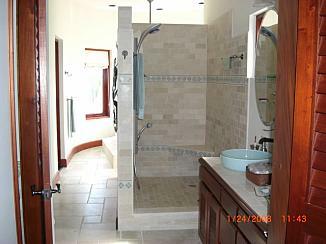 The Master Bedroom features a daybed, a Jacuzzi with an ocean view, a refrigerator and coffee maker. With balconies and verandas around the Villa, you may enjoy beautiful sunrises over the Caribbean as well spectacular sunsets over the lagoon. 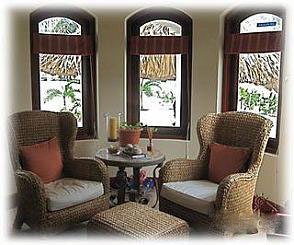 An abundance of little nooks inside and out with hammocks or seating provide you with private places to sit and read, nap, daydream or just 'let go' and disappear for as long as you like. The private pool completes the look and feel of Paradise. Surrounded by coconut palms and tropical plants, the pool features a shallow sunning area where, with the chaise lounges in the water, you can stretch out, relax and rest your feet or hands in the cool water and chill. 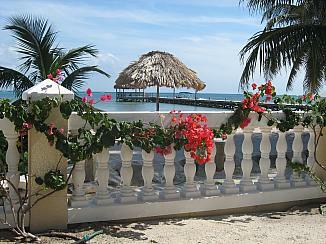 Next to the pool, for alfresco dining, is a gas grill under the palapa. LOCATION, LOCATION, LOCATION! 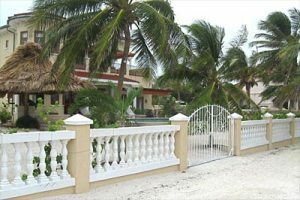 Adagio Villa is located 1/2 mile north of San Pedro just across the Boca Del Rio in the exclusive residential area of Tres Cocos. 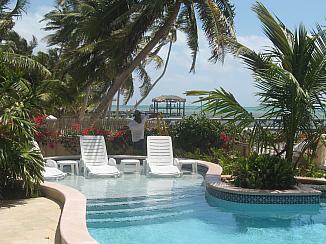 Here, Adagio Villa provides you with the beauty, privacy and tranquility you expect in a tropical paradise. Yet being only one half mile from San Pedro affords you easy access to all the shopping, dining and cultural activities you will find there. With the free bicycles provided you can bike to downtown in ten minutes or less. Walking is also an easy twenty minute option as well traveling by golf cart. Easy access to town, with yet a quick escape to your quiet tropical privacy, equals more freedom of choice in how you spend your vacation time. Whether your first choice in a dream vacation is adventure, relaxation, privacy or luxury; at Adagio Villa you can have them all. 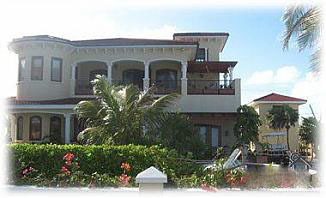 Let us help make your vacation dreams come true at Adagio Villa. No expense was spared in creating Adagio Villa: The sunken living room offers silk drapes, sumptuous furniture and a fully equipped custom entertainment center. The spacious commercial kitchen is a chef's dream, completely equipped and laid out to make the home chef's experience a delight. 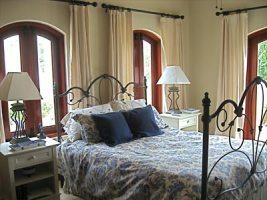 The three bedrooms are all en suite providing private and luxurious sleeping for 6. 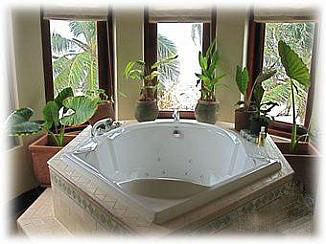 The Master Bedroom features a Jacuzzi over looking the Caribbean. There is also an office that can be converted into a 4th bedroom. Each bedroom has a balcony or veranda so one may enjoy beautiful sunrises over the Caribbean as well spectacular sunsets over the lagoon. The entire Villa and pool area are tiled with imported Turkish travertine and it is also zoned for air conditioning for economy. 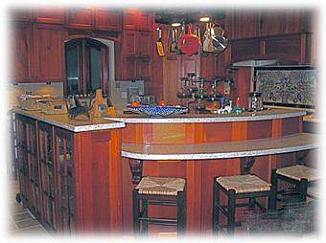 The trim and molding, cabinetry, doors and windows are all custom made of solid mahogany, cedar, Santa Maria and other exotic woods, surrounding you with warm luxury. 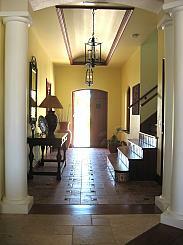 The columns and arches inside and outside the Villa allude to its Mediterranean influence. 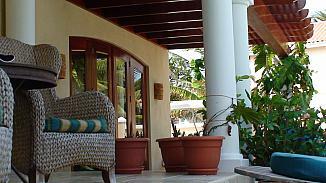 The private pool and garden nooks complete the look and feel of Paradise. Surrounded by coconut palms and tropical plants, the pool features a shallow sunning area with adjoining alfresco dining under the Palapa leading to the private pier. 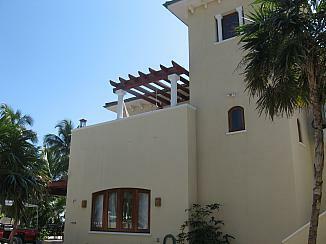 Other Amenities: Property is gated for privacy and security, private pier and palapa on beach, free golf cart use, free bicycles for six, two- 2 person kayaks, one single person kayak, snorkeling gear for six people, any planned day trips or excursions start from your pier.